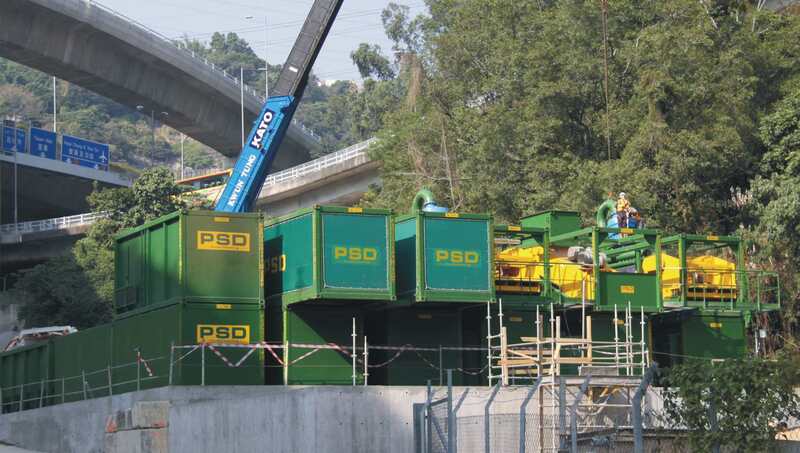 PSD's long lasting relationship with Hong Kong began in 1996 when PSD were approached by Gammon Kvaerner Joint Venture to supply desanding equipment to work in support of a Herrenknecht AVN1800D slurry shield TBM, cutting at 2140mm diameter, for the Central, Western & Wan Chai West Trunk Sewers on Hong Kong Island. The equipment, an SS240DP desander, was shipped to Hong Kong in 1997. In 1998, an additional SS240DP desander was shipped and in 1999 an SU8DP desilter was mobilised. The equipment returned to the UK in December 1999. Further work was secured at Aberdeen (Hong Kong Island) for an SS310DP desander to work in support of a Herrenknecht TBM excavating a cable tunnel through 400MPa rock. Another chapter began in 2001, with PSD being awarded the contract to supply a 900m3/hr slurry treatment plant with supervisor to China Harbour Transfield Joint Venture in support of a Herrenknecht 5.18m diameter TBM excavating a deep sewer for the Kai Tak Transfer Scheme. Equipment was shipped in 2002 and returned to the UK on 2004. After a very successful project, PSD were asked to supply a 1350m3/hr slurry treatment plant and full time supervisor to work in support of a Herrenknecht 8.0m diameter slurry TBM. The project consisted of two drives totalling 2.3km for and underground railway tunnel for the Kowloon Canton Railway Corporation. This project began on site in 2006 and finished in 2008.